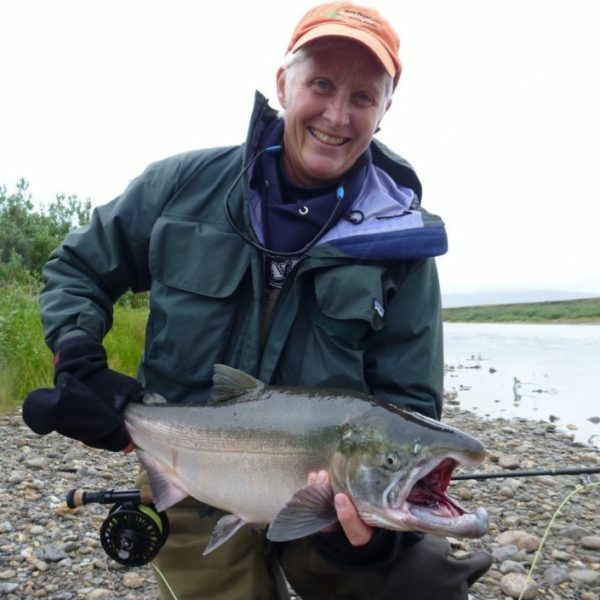 Get off the beaten path and come to Nome, Alaska to experience world-class fly fishing for Coho Salmon, Dolly Varden, Northern Pike, and Arctic Grayling! Our weeklong guided trips include either 5 or 6 days of helicopter fly out fishing. Each morning we’ll depart right from the backyard on an adventure to a new stream where few anglers ever wet a fly. Look for bear, moose and musk oxen as you fly above the Alaskan landscape in our maneuverable helicopters. 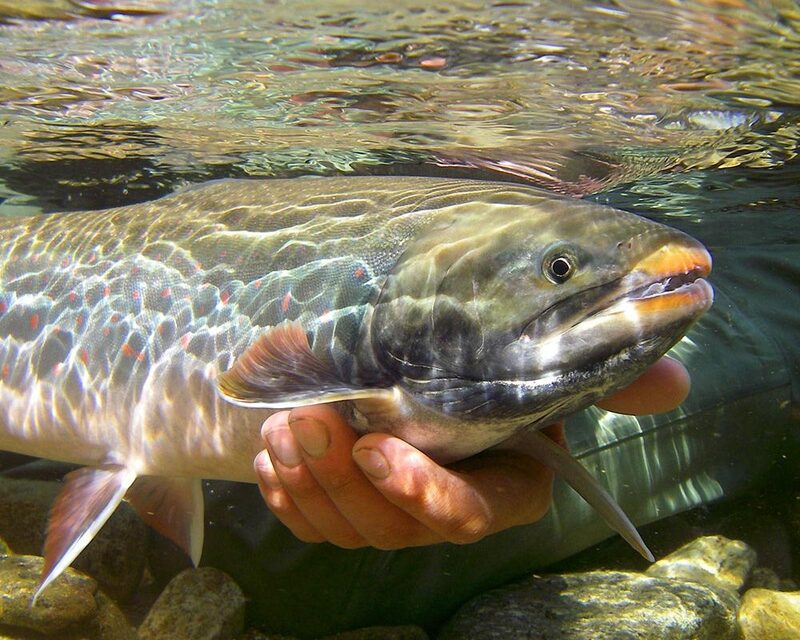 You and your guide will hike down river together targeting fish along the way. Enjoy a complete lunch stream side to keep you fueled up for the afternoon. Continue fishing on down the river without ever the need to back track, as the helicopter will pick you up when its time to head for the ranch. Evenings are spent in our comfortable hosted cabin accommodations, featuring appetizers and cocktails, excellent meals, beer and wine all included. We’ve even got a wood fired hot tub for a soak on the back deck. 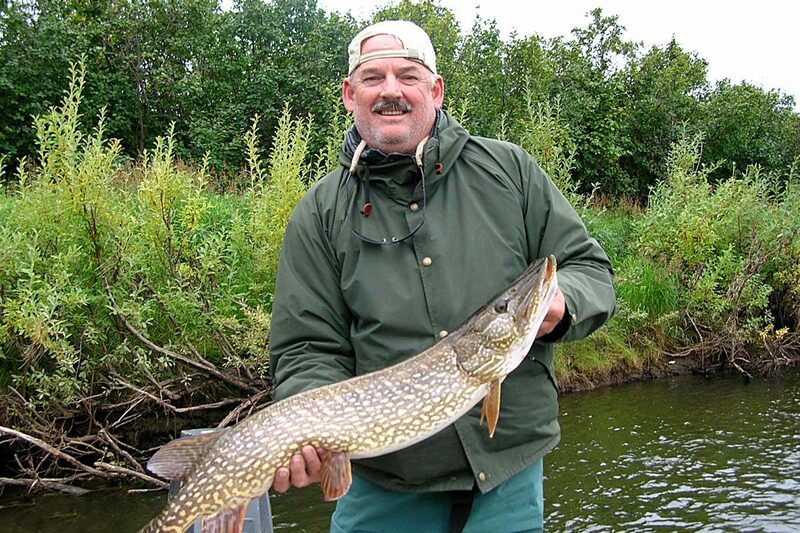 Join us in Nome, Alaska for the fishing trip of a lifetime! Is there internet or cell service at your cabin? Do I need my own fly fishing equipment? Do you have regular bathrooms? What about the guest cabins? I have never fly fished before. Is that a problem? Can we see northern lights? I have another question that’s not listed here, what should I do? No. Cell service from AT&T and GCI are available in Nome, but not out in our valley. A short evening drive to town can be arranged for emergency cell service needs. We have a satellite messenger and satellite telephone at camp that also may be used for calls as needed. Our fishing season is during the month of August. Expect normal nightly lows of 40 to 45F, and daytime highs of 50 to 70F. In addition to chest waders and a good wading jacket or rain jacket, several layers should also be available, as well as a warm hat and gloves. It’s better to be prepared. If you are comfortable, you will have a lot of fun. Our pilots are held to the highest standards by the Bering Air and the Federal Aviation Administration. Bering Air has an impeccable safety record since 1979 in many types of helicopter and fixed wing operations. You will receive a detailed helicopter safety briefing and we’ll take care to keep you safe throughout the week. Pilots are continuously monitoring weather conditions for a comfortable ride, ability to make it home at the end of the day, as well as where the best fishing will be. Your guides will brief you on safety around the wildlife, and good habits around camp. Your safety is our highest priority during your stay, and we welcome any concerns to be brought to our attention immediately. If you have your own fishing gear, that’s great. If you don’t, or you don’t feel like packing it, that’s great too. We have all sizes of high quality fly rods and reels, plenty of flies, and can even make chest waders and jackets available. We will discuss all this during your booking process to make sure we are completely prepared for your needs during the week. Please visit our “Guides” page to read a short bio on each guide. All guides are passionate about fly fishing, and some are also passionate about flying and cooking too! Each one of us does this for fun, and we sincerely look forward to meeting you and enjoying an amazing week together. Because of our clients, we have been fortunate enough to do this for quite a number of years, and look forward to more to come. We have a bathroom in the main cabin with a sink and shower with hot/cold well water. The water is also very clean and good drinking water. The toilet is an outhouse, 2 in fact, that are right outside the cabin. If you’ve never used an outhouse, it’s really no big deal, comfortable and clean and the smell stays outside! The guest cabins are “dry”. There is a water container that we can fill at the main cabin for basic needs (brushing teeth, drinking, etc) and a wash basin. The cabins are very warm and comfortable with brand new beds and and oil drip stove for heat. Small battery powered lanterns are provided for light. Electric boot dryers are available in the big cabin, just next door. Meals and entertainment take place in the main cabin, and you can retire to your private quarters when you need some quiet time. Absolutely not. We are happy to teach fly fishing, we do it all the time. Our trip is a great place to learn to fish, as there is lots of action to keep you interested. The only downside is you will be totally spoiled for fishing anywhere else! Yes! Northern lights, also known as Aurora Borealis, are often present during our fishing season in August, especially toward the end of the month. On very clear, calm nights around 2-3am they are often spotted right off the deck in the northern sky. Contact us anytime! We love to hear from you and answer your questions. And it will help us populate our FAQ section. Thanks! What are your Trip Payment Policies? $2000 is required to make a reservation. The balance is due by March 15 prior to your fishing trip. If making the reservation after March 15, the total trip cost is due to hold the reservation. Total trip cost minus a $500 cancellation fee from each person is refundable if the trip is cancelled prior to March 15. If cancelled after this date, no refund is available unless we can resell the week, and you will be responsible to pay the entire cost. Ask us about our Flat Rate Airline Ticket program! This offer is subject to availability and must be booked 6 months or more prior to the start of your trip. • Europe, round trip to Nome Market Rate, ask us for a quote! This is a trip of a lifetime and a great deal of your hard earned money is being put down to reserve your spot. As illness, injury or other unforeseen events are unpredictable, we highly recommend travel insurance to protect your investment. New for 2018 we are offering our own in house trip cancellation insurance, or you may purchase one from a third party vendor. We are pleased to offer our own trip cancellation insurance policy to give you piece of mind while planning your Nome adventure. Purchase our plan directly from us in one easy step at the time of initial trip reservation only. Our coverage allows trip cancellation at ANYTIME for ANY REASON, no questions asked, prior to start of the trip with written notice. You will receive a full refund, minus a $500 administration fee. The refund amount can stay on our books and be applied to any trip we offer within the next season (fishing or skiing), or will be returned to you no later than October 15 of the same year following the cancellation. Visit travelguard.com or sevencorners.com to learn about polices and rates. We are in no way affiliated with either provider, however some of our clients have used them and been happy with their service. Many options and coverages are available; its best to research the option that works best for your situation. A plan that covers medical expenses out of network may be a good idea. We are unable to offer refunds due to inclement weather. However, in case we are not able to fly at least one day during the week of your trip, you will receive a 25% credit toward any trip that we offer (ski or fish), valid for the next season. I’ve never had to use this guarantee, as normally we are flying every planned day for fishing and most days for skiing. Of all of the places that we have been this is one of the best, great fishing, love the helicopter, but it is you and your guides that really makes Twin Peaks stand out from the rest, thanks a lot!